When Disney’s Brave hit theaters last summer, feminists rejoiced. Finally, a Disney Princess that is real. Princess Merida was not refined, she did not sing about finding love, and she was completely comfortable with not brushing her hair. What once seemed like a realistic character turned into just another face in the Disney lineup when Disney unveiled the new design for Merida. Meet Princess Merida. She’s a curvy, rambunctious red-head with archery skills to make Katniss Everdeen jealous. When her mother wanted to set her up with one of the eligible, but obnoxious, bachelors of the kingdom, Merida shrank from her prospects. She fought and won her own hand, upsetting the whole kingdom. From that point on, the movie focuses more on Merida changing her mother into a bear than her strength as a female. However, Merida’s look and attitude brought in the fans and left a lasting impression on young girls. Come hither, Disney Princes. 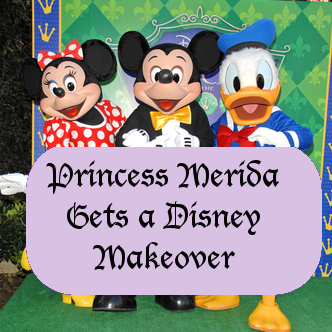 Princess Merida has a new look and lower neckline to entice you. Disney brought in Princess Merida’s waist line, cleaned up her unruly mane and gussied up her plain blue dress. The new Merida has a lower neckline, more sparkle, a flashy belt and does not carry a bow and arrow in her character profile. While the look may not seem much different at first glance, study the image for a few minutes. You will see just how different the characters are. Co-creator of Brave, Brenda Chapman, had some scathing words for Disney about the change. Chapman went on to slam Disney for the changes in her character. Merida was recently crowned at the 11th Disney Princess, focusing on her strength and bravery.